The history of the Maxwells association with Haggs Castle begins in the late thirteenth century. Sir Aymer Maxwell acquired the barony of Nether Pollok about 1270. His older baronies of Maxwell and Caerlaverock, located near the English border, were subject to hostile attacks and required all his energies for their protection. Having little time to devote to the distant barony of Pollok, he turned that responsibility over to his second son, John, who became the first Baron of Pollok. In 1515, James Beaton, Archbishop of Glasgow, took advantage of the political situation in Scotland after the defeat at Flodden to fue the lands of Haggs, Govan and Shields to Robert Maxwell, the Vicar of Tarbolton. These lands lie to the north of the original Barony of Pollok and were combined with the Barony of Pollok to form the Pollok Estates. Haggs Castle would eventually be built on the lands of Haggs. Robert Maxwell remained in control of Pollok by acting as guardian of Elizabeth Maxwell, heiress of Pollok during her minority. At least two castles preceded Haggs Castle on the Pollok Estate. The earliest Castle of Pollok may have been built by Sir John Maxwell shortly after he became proprietor of Pollok in the thirteenth century, but the armorial bearings of Sir John Maxwell of Pollok and his wife Isabella Lindsay, who were married about 1367, were found in the ruins of the Castle. It was built on the shore of the river White Cart and in the 1860s a rude wall was still standing, which, according to tradition, was part of that original castle. The second castle of Pollok was erected about 300 yards to the north of the first castle. This castle continued to be the residence of the Maxwells until the middle of the 16th century. When George Crawfurd wrote his account of Renfrewshire in 1710, both the fosse and the drawbridge of this castle still existed. Following the death of his father on the 20th of February 1577, Sir John Maxwell, 12th of Pollok, was not able to gain possession of the Pollok Estates as it was liferented by his mother. Serious problems arose between John and his mother. In the year following her husbands death, Elizabeth Maxwell raised a complaint against her son John before the Privy-Council, which set forth that on the 29th of May 1578, John and his accomplices invaded Pollok, imprisoned his mother, and shed the blood of her servants. She further complained that on the 17th of August of the same year, John stole a chalder of malt and a grey horse worth 100 merks, and on the 26th of February 1579, he and his accomplices violently ejected her tenants and fortified the place with artillery. John was ordered not to molest his mother on pain of a 10,000 merk fine. Three years later, John raised a complaint against his mother alleging that she had allowed the buildings to rot and decay for want of repairs and she had cut growing trees in the woods and orchards causing great injury to him. John appears to have taken effective control of Pollok Estates as a result of a charter from the Archbishop of Glasgow dated June 1581, and confirmed under the Great Seal in October 1583. Johns mother apparently remained in the Castle of Pollok until her death, but she does not appear to have been reconciled with her son as he is not mentioned in her will. We find Sir John writing his father-in-law, William Cunningham of Carpington, asking for a loan of 500 merks in order to complete the castle. This evidently was not enough, for in January 1587, he again wrote saying the castle was almost complete but he needed a further loan of 300 merks to finish it. Cunningham must have given Sir John financial guarantees before construction was begun because he says that he would never have INTERPRYSIT SICC ANE WORK (begun such work) without them. He also states that I ASCHAME THAT MY HOWS SOWLD STAND LYCK AN TWME KIRNE BEING SA NEIR APOINT (I am ashamed that my house should stand like an open chest, being so nearly finished). Sir John had previously encountered other difficulties in the building of Haggs Castle. He complained in a letter to the Laird of Minto that the mason, Robert Boyd, had contracted to supply one thousand hewn stones but had broken his promise. Sir John asked that the Laird of Minto discharge Mr. Boyd from his service. For some ten years after its construction, Haggs Castle seems to have been the main residence of the family, but the death of Sir John Maxwell, 12th of Pollok, in a skirmish at Lockerbie in 1595 once again threw the familys affairs into turmoil. After the death of Margaret Cunningham in 1590, Sir John took another wife, Marjory, daughter of Sir William Edmonstone of Duntreath. Their marriage contract bears the date at Stirling, 17th of September 1592. Sir John Maxwell had given the house and the lands of Haggs to his second wife when he was not legally entitled to do so because the property was only held in fue. Sir John Maxwell, 13th of Pollok, entered into litigation with his stepmother to gain possession of Haggs and in this he was supported by Sir Hugh Campbell, his father-in-law. To lend weight to their case, they garrisoned Pollok and Haggs Castles, tampered with witnesses and attempted to corrupt the lords in the Court of Session. These measures, coupled with having a better case to start with, paid dividends for Sir John and by 1599 he had entered into full possession of Haggs. For the next sixty years, Haggs seems to have been bypassed by the events of Scotland. Suddenly in 1660, Haggs Castle is thrust once again into controversy. The Presbyterian form of worship was rooted in Judaism, where the synagogue and congregation were directed by elders (presbuteroi). The church was to be independent from the state and was to be governed by a sequence of courts from the Kirk Session, Presbytery, and Synod to General Assembly in which all ministers would be equal. In the 1600s, the Steward kings outlawed presbyterianism and reintroduced episcopacy, wherein the church is governed with a hierarchy ruled by bishops (episkopoi). Sir George Maxwell, 14th of Pollok, and his son, Sir John, seem to have been deeply committed to the extreme wing of the Presbyterians. Party of the reason for this may have been that the Rev. Alexander Jameson, minister of Govan, married Sir Georges sister in February 1661. Jameson had been Dean of the Faculty at Glasgow University when he was deprived of his position by an act of Parliament in 1662. The Maxwells were repeatedly fined and imprisoned to make them abandon their convictions. The extremists used Haggs Castle as a suitable place for their secret conventicles and the Maxwells, Jameson, and their adherents were called to account for their actions before the Archbishop in both 1667 and 1674 but the evidence suggests that conventicles were held weekly at Haggs throughout that period. Sir John Maxwell, 15th of Pollok, never abandoned the principles for which he stood, despite imprisonment and a crippling fine of �8,000 in 1684. He was still negotiating with the government about his fine in 1688 when James IIs government was swept away and he was freed from the obligation to pay. By the middle of the eighteenth century, Haggs Castle with its small rooms and narrow stairs had become an unsuitable home for the Maxwells. In 1747, Sir John Maxwell, 3rd Baronet, began building a new house in Pollok Park and completed it in 1752, the year of his death. When the family moved into their new home, Pollok House, Haggs Castle was allowed to fall into disrepair. By 1840, the castle was in ruins and the lower floor had been turned into a smithy to service the local coal pit about a quarter mile south of the old castle. In the 1850s, work was begun to consolidate the building, and by 1860, Sir John Maxwell, 9th Baronet, had fully restored the castle for use of his estate factor, Thomas Colledge. Mr. Colledge apparently occupied the castle until his death in 1899. By May 1900, Sir John Stirling-Maxwell had enlarged the castle by adding a drawing room and billiard room on the north side and a new entrance and circular staircase on the south side. These additions considerably altered the original plan of the castle. The castle was let to a Mr. J.C. Murray, who occupied it until 1930. After Mr. Murrays death, the castle passed through various tenants until 1943 when the government requisitioned it for military purposes. After the war, the building was divided into four flats. Toilets, bathrooms, and kitchens were created for each flat. These flats were rented out until July 1972, when the castle was bought by Glasgow Corporation for use as a museum. Conversion into a museum involved taking out all the flats, reroofing the building, complete rewiring and modernization to comply with regulations for a building to be used for public access. Haggs Castle Childrens Museum was opened by John Craven of BBCs Newsround Programme in 1976. The main object was to interest children in the ways of life in the past, particularly the 16th century, to commemorate the era in which the castle had been built. Over the years, the museum enjoyed great success, attracting over three quarters of a million visitors both in organized parties and private visits. As the fortunes of Haggs Castle have changed over its 400 year history, so has it once again changed more recently. In 1996, Haggs Castle Childrens Museum was permanently closed and the museum collections put in storage. 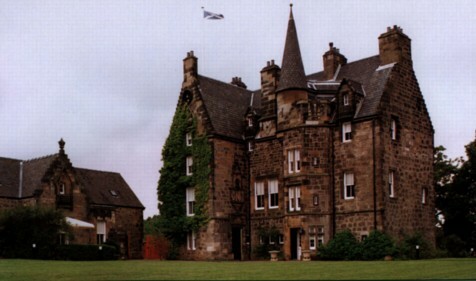 Haggs Castle was the victim of the 1996 reorganization of Local Government in Scotland, and the building was earmarked to be sold. Want to Visit Haggs Castle? If you would like to include Haggs Castle in a visit to Scotland, contact the current owner, Hugh Boyd, for information regarding arrangments. He can be reached via telephone at 0141 427 7974 or by mail at Haggs Castle, 100 St Andrews Drive, Glasgow.